Click here to see the newest version of the fatality map. The first map shows fatalities resulting from various causes. The second map shows only fatal falls. 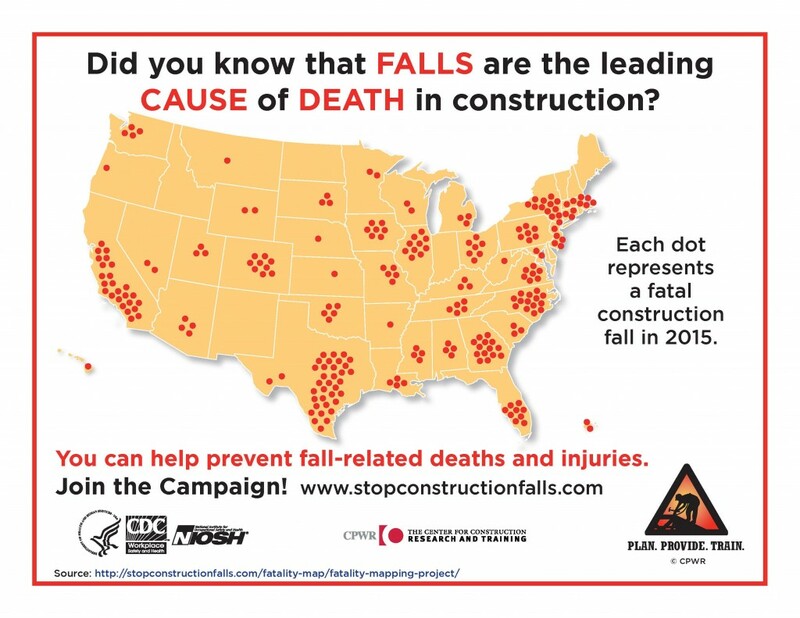 If you are aware of a recent work-related construction fatality, please email fatalitymap@cpwr.com. You can check the most updated Fatality Maps at our Fatality Map page. Visit the 2016 Fatality Map here. If you are aware of a recent work-related construction fatality, please email fatalitymap@cpwr.com. 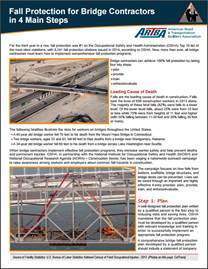 The ARTBA Work Zone Safety Consortium recently released a series of fall prevention fact sheets for bridge work. Check them out over at the Work Zone Safety website. Check out the new infographics available now! As a campaign partner, Harness, a company that provides modern solutions for managing safety and health, developed a new mobile app that gives contractors and workers easy access to Stand-Down materials from stopconstructionfalls.com and beyond while on the jobsite. The app also allows users to share activities and post photos from their stand-downs. Download it through the Apple or Android app stores, or at nationalsafetystanddown.com. You can see more Spanish materials over at our Spanish page.